Now The Details: "The Internet is to News, What Car Horns are to Music"
"The Internet is to News, What Car Horns are to Music"
So says a crusty and cynical editor in a terrific new novel about the newspaper business. Written by Tom Rachman, "The Imperfectionists" recounts the tensions that abound in a small American owned daily paper based in Rome. Loosely modeled on a blend of the now defunct Rome Daily American and the still functioning Paris-based International Herald Tribune, the novel uses each chapter to describe the characters who run the claustrophobic newspaper that interestingly enough, Rachman never names. There's Kathleen, the tough but talented editor-in-chief, who has an open marriage at home and offended by the constant betrayals that occur both in the bedroom and the newsroom. Arthur is the work-avoiding obit writer who writes about death then has to deal with it in his personal life as well. Abbey is the chief financial officer who is expected to make the cuts in the staff, knowing that this can't save the paper, even as she throws journalists' lives - and her own - into turmoil. An aging stringer in Paris tries desperately to sell a story to the paper by pressuring his son to give him a story, any story that will keep him employed. Winston is the neophyte Cairo stringer, with no journalism experience, trying to figure out how be a foreign correspondent in a city that utterly confounds him, and with absolutely no guidance from the newsroom, only to be out-hustled by a completely unscrupulous "Roland P. Hedley" character. And forced into a role he never wanted, is the unwilling publisher who grimly flies in from Atlanta to deliver the coup de grâce with horrifying consequences. "Journalism is a bunch of dorks pretending to be alpha males." "Newspapers are like anything else: they're pure and incorruptible and noble - as far they can afford to be. Starve them and they'll kneel in the muck with the rest of the bums. Rich papers can afford to be upstanding and, if you like, self-important. We don't have that luxury right now." "The paper started as a terrific idea...but somehow it has ended up as blotting paper." "...he understood this breed backwards and has foreseen how his speech would be received. Journalists were as touchy as cabaret performers and as stubborn as factory machinists. He couldn't help smiling." 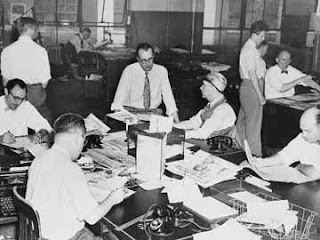 Newsrooms today feel a lot tamer as financial pressures make fewer allowances for individuality. The internet plays a powerful role in defining the daily news agenda and chasing that elusive demographic has become the Holy Grail for all media. Still it's easy to romanticize the news business as it once was. To his credit, Rachman shows that newsrooms filled with dysfunctional characters, then and now still have the same challenges - finding the right stories and making them both interesting and useful for an audience that is driven to distraction by an increasingly bewildering array of options. In "The Imperfectionists" the personal tragedies of the newsroom staff are the foreground to a business that inevitably seems bound to break their hearts. BUT, I'm actually annoyed that you would be so lazy as to include the phrase "despite all odds". I understand and can relate to the passion for print that lingers for a lifetime once a person has worked at a newspaper. The only time I think you can apply the phrase "despite the odds" is when one is trying to put out an underground newspaper in a country that's occupied by the Nazis, and certainly not the egoists of an established newspaper. What, they're all thalidomide babies drooling on the page? You are right. It's unnecessary.